When figuring out the power system for the boat, I used several methods of scaling the power down from the original. One method started with the horsepower of the original, another the displacement as a function of length, width, and depth. Both methods resulted in an estimated power requirement of somewhere between 500 and 750 Watts. Of course, the ultimate performance will be related also to the propeller size, pitch, etc and other factors affecting the RPM of the propeller shafts. I thought that it would be smarter to run at a somewhat lower propeller shaft RPM and drive props that were larger than scale with a moderate pitch. The boat is powered by three PropDrive 28 electric motors. They are rated at about 1,100 rpm per volt and can handle up to 15 volts. 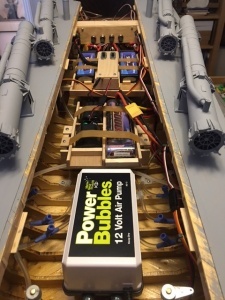 I had planned to use one large capacity 12 volt LiPo battery to power the boat motors and the air pump, but decided to start with lower voltage 7.4 volt LiPo batteries, one for each motor, figuring that the lower RPM might produce more realistic scale performance and that I could always increase the operating voltage if needed later on. Also, having multiple batteries might avoid problems if one battery ran low and shut off. 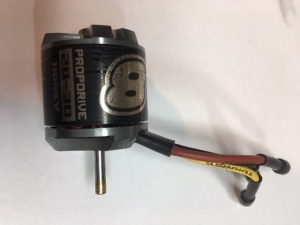 The motors are small, smaller than a thimble of thread, just over an inch in diameter (28mm) and very powerful, rated at 189 W at 11.1 v (3S LiPo) and 290 W at 15 v (4S LiPo). 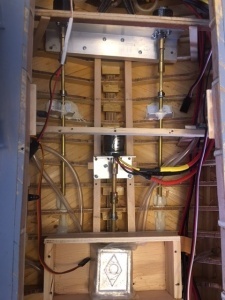 I estimated the power as about 110 – 120 W at 7.4 v (2S Lipo) for a total of 330 – 360 W for the boat, less than the estimated requirement. But again, if the performance was lacking, I could up the batteries as necessary. 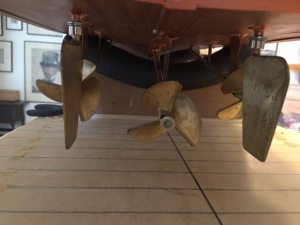 This shows the three motors installed in the hull and the stuffing boxes for the three props. Aft of the center engine is a box built to hold ballast if needed. In this picture, there is a one pound metal weight in the box, which can hold two such weights. During initial buoyancy testing, I added two pounds of ballast in the box, but later, after addition of the torpedoes and other weight (crew figures), I could remove the ballast and the boat floated on the waterline. I tried using a single ESC to control all three motors without success. I found it might control two but not three motors. In the end, I powered the boat with the three NTM PropDrive motors, each with individual battery and water cooled ESC. For the ESC, I use the Turnigy AquaStar. The center engine has an older version, and the two wing engines a newer version. The air pump is powered by a separate 8.4 V NiCd battery. And there are two 6 volt NiCd battery packs for accessories. This picture shows the batteries installed in their boxes. The three LiPo batteries for the motor are forward and run through the three toggle switches on the left. The right hand toggle switch controls power to the air pump. The slide switches control the accessory 6 v batteries on the left of the after battery box. The props are plastic and rotate counter-clockwise, which is not to scale. They are also larger than scale, which was done by design, hoping to compensate for lower shaft rotation speed with a bigger bite. The props are inexpensive and easily replaced. Since I will be running around in the local bayou, full of debris and hazards, replaceable props are a necessity. The prop shafts are 3/16″ brass rod, running in stuffing boxes of 7/32″ brass tubing. 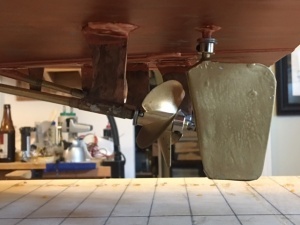 The prop struts were fabricated out of brass and copper and then epoxied to the hull. The center prop shaft and engine mount are at a different angle than the outer shafts, which is consistent with the Higgins design. Rudders are fabricated from copper sheet wrapped around 3/16″ brass rod and soldered to the rod and together. Both the prop shafts and the rudder shafts are larger than strictly scale, again because of the operating environment. The Higgins boats had two rudders unlike the ELCO boats which had three. The rudders on the model are also oversize and extend deeper than scale to avoid problems with loss of rudder control due to prop wash/cavitation at speed, which had been a problem for me with earlier models using scale sized props and rudders. The boat had its first water trial in February and did pretty well. The motors were coupled to the shafts using Dumas couplings and the nylon “dogbone” coupler sheared off its ears on two of the three motors. There is a video of the boat running up to speed and you can see the loss of power as the couplings sheared. Fortunately, the portside wing engine coupling held and the boat made it back to shore instead of drifting away into Lake Pontchartrain. I reworked the couplers, replacing the nylon dogbones with soldered brass tubing. This arrangement ended up working well on a second trial and produced pretty realistic performance, although the extreme torque and power of the motors caused problems keeping the drive coupling attached to the motor shaft. The set screws loosened on two of the three motor shafts and once again, the boat made it back on a single engine. I am still working on this issue, and will update on results.